While one of the great things about football is the role that club supporters can play during matches: songs, chants, and visual displays can sometimes inspire their club to find that next goal or not give up the lead during a match. 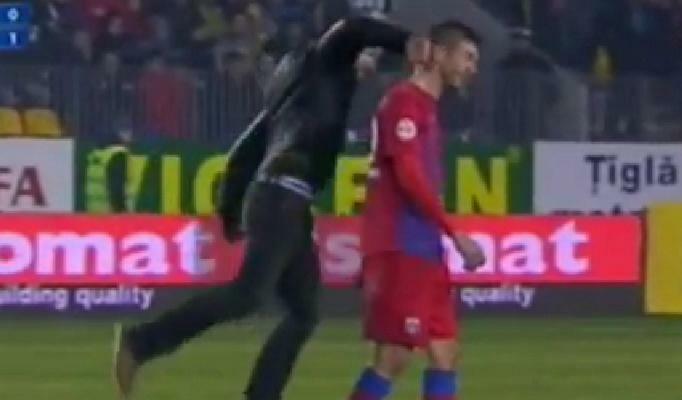 Unfortunately, this past weekend some fans of Petrolul Ploiești in Romania took things a step further when one fan, Dragos Petrut Enache, sucker punched a Steaua București defender, George Galamaz. Not surprisingly, Galamaz's teammates took matters into their own hands until Enache was hauled off by stadium security/police. But the violence wasn't over yet, as Enache was led off the pitch other Petrolul Ploiești fans began throwing flares onto the match, managing to hit Steaua keeper, Ciprian Tatarusanu, with one of the flares. The match, which Steaua was leading 2-0, was abandoned and the Romanian FA have since fined Ploiesti an amount close to £2,000. The supporter culture in the United States has grown significantly since the birth of MLS in the mid-1990s, and while there have been some unfortunate incidents involving violence, violent pitch invasions of the sort that occurred in Romania this past weekend have not occurred, let's hope it stays that way.